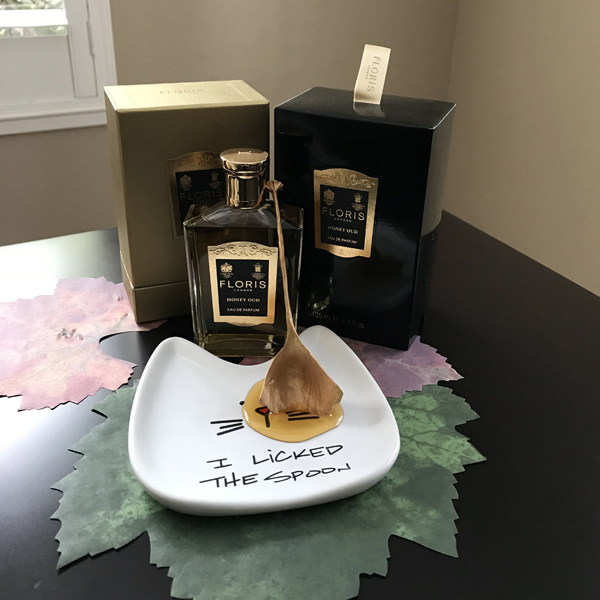 This entry was posted in "Four legs good", Favorite Perfumes and tagged Floris, Honey Oud. Bookmark the permalink. The cat that got the ….. honey. Like you, I am not a fan of honey, oud, tuberose or cumin, but I have been surprised to find all four of those in certain fragrances I like! That’s why sampling, either from little vials sent by friends or sprays in a department store, can be very instructive. I agree with you that buying samples can turn out to be an expensive business in the long run. Surprisingly, Rusty wasn’t much interested in honey – probably because it has no fat in it. I haven’t had a chance to try any Floris perfume, none of the shops in Poland carry the brand. I would probably make assumption similar to yours, that oud and honey won’t work on my skin – even if I’m more tolerant to oud than you are. Happy to hear that it actually worked and was worth a full bottle. Yay! If I counted my full bottles I think 75% would be a result of having sample before. I did buy my very first Prada Amber Pour Homme only after spraying it multiple times on myself when I had access to Sephora & I bought Amber Pour Homme Intense blindly. Otherwise many started from a sample. I’ll add this and one more Floris that I have to the stash of samples I’m collecting for the next package to you. Surprisingly, it proved to be a very popular perfume: I had no problem splitting half of it at the recent NTS’s splitmeet – all to the U.S. members! I don’t think I tried any of Jacques Fath perfumes… At least, not from this decade. So far I made two “blind buys” of perfumes: I’m happy with the second (I need to finally write about it) and I’m OK with Chanel No 19 Poudre though I could live without it, and I do not plan to re-purchase it once/if I’m done with the bottle. I will pass along my Jacques Fath mini sample set of 4 perfumes. The set was included in the Barneys Fall Beauty Bag event (I think it was the Handsome version). The set does not include Rosso Epicureo. You are sweet :) But are you sure you tried Floris’ one and not its namesake from Montale? I haven’t tried that one but read several not that favorite mentions of it in the context of comparing these two. No, it was Floris…and twas not for me. Was this from Sniffapalooza when it was a take as many Floris samples fans you want spree? No, I received some from Floris directly. I received my Jermyn Street sample from Sniffa. though. Did you go this fall?? Haha! Great last line. Never say never, but I’m with you on that combination. I’m tempted now and again, but like you, the disappointment is greater when you’ve paid for a sample and you don’t love it. My strike rate is also abysmal. Congratulations on your Honey Oud! Yeah, I also noticed that over years my success rate with perfumes I test makes it a questionable investment to pay for sampling. I never heard of that one. Now I want to seek it out! I probably order more samples I pay for than it sounds like you do, and I also am sad when I don’t like them at all. Better than buying a full bottle I guess, though. When I was just starting, I was buying a LOT of samples. But over years I tried most of “best of the best of the best” that were on everybody’s “must try” list, less and less of samples I paid for were satisfying. So now I’m much more choosy. I love the photo of your cat after he licked the spoon of honey! And I’m glad your minus and minus = a plus. Great review. I sample a lot- and have bought many of those samples – not much available locally to sniff. The only upside of paying for a scrubber is that I have fodder for swaps! I have managed to resist blind buying anything full price – buying the samples first so those were worth the investment. Oh, no – blind buys are out of question, those are rarely successful. And swapping samples is definitely the way to go: since our tastes are so different, one person’s “hate” or “meh” might be another one’s delight – just for the price of shipping. 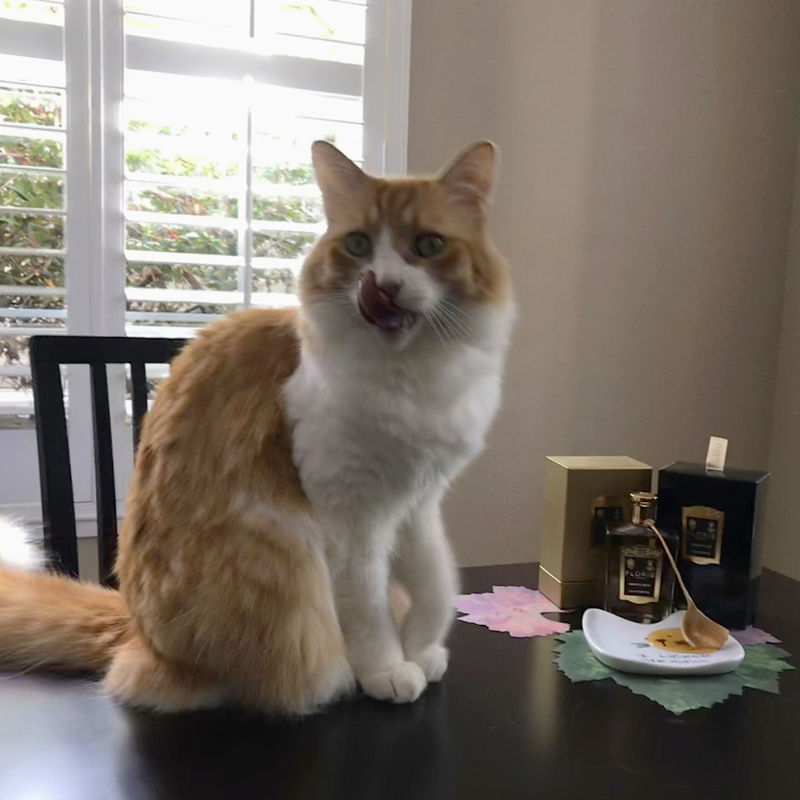 Your Floris Honey Oud sounds delicious, both by your description and by your images (Rusty licking his lips, especially!). Regarding your question,I thought I remembered Asali (Sounds of Scent) really liking Histoires de Parfums Tubereuse 3 l’Animale, and she never used to like tuberose. Have you ever tried that one? I’m not familiar with it myself, I just have this memory (I hope it’s correct, maybe she’ll chime in here) of it being one of the first tuberose scents she ever found irresistible. “Delicious” describes this perfume really well. Every time after Rusty eats anything – be that his regular meal or a lick of honey – he needs to clean himself thoroughly. And with iPhone’s Live Pictures feature it got easier to “catch him in the act,” so to speak. Rusty licking his lips is a priceless spectacle! I would have been wary of this like you, but am reassured by your good experience with both the honey and oud elements. And I couldn’t agree with you more that when you are disappointed by a sample you have shelled out money for, the disappointment is much keener than when you smelt it for free! I am that soldier, many times over, though not lately. On a side note, I was completely blown away by two more samples in a batch you recently sent me – I think either one is FBW in my view, further confirming the power of samples to lead to major lemmings. I will be really curious to know which ones you liked. And I’ll have the next batch for you soon, I think :) Samples that just happen to find their way to us are so much more satisfying! I didn’t realize how long Rusty’s tongue was until I took that picture. Sounds yum to me. I was flabbergasted when I did the math on a decant of Iris Silver Mist and was horrified at the mark-up. Although I still buy samples (of various sizes), I am becoming more savvy in requesting samples with my orders and/or while out shopping. Love the pic of Rusty licking his lips! Having done my share of decants/samples, I realize that it’s a lot of work, and there are all kinds of additional expenses that we absorb as individuals but business has to recuperate and they need to make a profit – but still, those samples and decants are extremely expensive. Sometimes it costs not much more to get a 5 ml decant in split than to get a 1 ml sample from a decanter site. Samples sometimes help me in making decisions. Sometimes I will even have a more favourable view of the brand if free samples are available, which I admit is not always the best way to go about it. Glad to read Rusty will be rewarded for his usual photogenic prowess. Next week I am going to be visiting one of the few niche fragrance stores in Johannesburg for a catch-up. They stock Floris, so will look out for this Floris Oud. Great post, as always, Undina! Thank you, Richard. If you go there, try Leather Oud as well. I think that having samples is an important part of running a perfume business, so I do count it as a “plus” if the brand has samples – not necessarily free though I think that it’s nice when they have some type of a sampling program where you pay to try but then can redeem that price if you buy a bottle. I also feel more favorable towards brands that have small(er) bottles.